WASHINGTON - The United States and its European allies on Thursday demanded an end to four decades of brutal family dictatorship in Syria and underscored the tough talk with new sanctions on President Bashar Assad's government. In Thursday's coordinated statements, President Barack Obama and the leaders of Britain, France, Germany, Canada and the European Union called for Assad to resign, saying his repression of demonstrations inspired by this spring's Arab uprisings made him unfit to lead. The new effort signals the end of the world's thin patience for Assad, once viewed as a Western-looking pragmatist who might expand freedoms at home and help achieve an Arab peace deal with Israel. In a statement released by the White House, Obama said Assad had lost all credibility as a leader and had to go. "His calls for dialogue and reform have rung hollow while he is imprisoning, torturing, and slaughtering his own people," Obama said. "We have consistently said that President Assad must lead a democratic transition or get out of the way. He has not led. For the sake of the Syrian people, the time has come for President Assad to step aside." British Prime Minister David Cameron, French President Nicolas Sarkozy and German Chancellor Angela Merkel issued a joint statement saying that Assad should "leave power in the greater interests of Syria and the unity of his people." European Union foreign policy chief Catherine Ashton and Canadian Prime Minister Stephen Harper also joined the chorus of condemnation. In Geneva, a high-level U.N. human rights team said that Syria's crackdown "may amount to crimes against humanity" and should be referred to the International Criminal Court. The U.N. investigators say they had found "a pattern of human rights violations that constitutes widespread or systematic attacks against the civilian population." 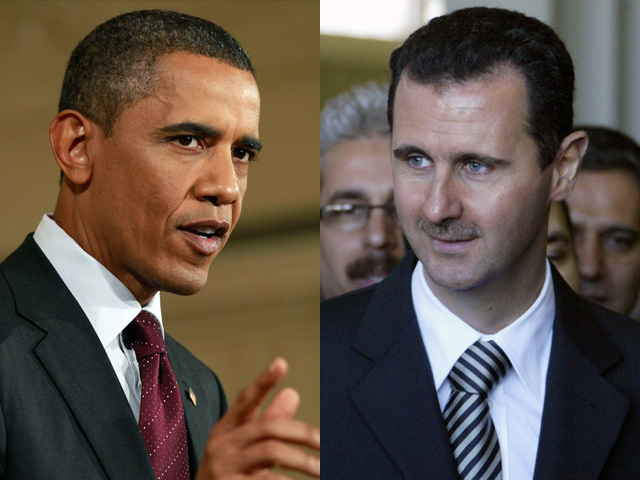 Obama said Assad was wrong to think he could silence the voices of his people with repressive tactics similar to the ones his father, Hafez Assad, used to crush opponents in the 1980s. Obama signed an executive order that gives his administration authority to impose sweeping new sanctions on Syria intended to further isolate Assad. The order immediately bans the import into the United States of any Syrian petroleum or petroleum products. Syria is not a huge source of oil for the U.S., but if European allies join the effort, it could significantly affect one of the government's top sources of revenue. Syrian crude oil exports go mostly to European countries such as Germany, Italy and France, according to the U.S. Energy Information Agency. Obama's order also denies Syria access to the US financial system, freezing all Syrian government assets that are subject to American jurisdiction. It prohibits any U.S. citizen from engaging in transactions with Syria, investing in the country or exporting services there. American officials acknowledged that the U.S. moves alone may not have an immediate impact on the Syrian government, with which the U.S. has few trade or other financial ties. The U.S. had already hit more than 30 Syrian officials, including Assad himself and members of his inner circle, and firms with sanctions. It has also lobbied other nations to follow suit. But the administration was careful to try not to appear highhanded or meddlesome in a region where suspicion of U.S. motives is rampant. Some of the Syrian protesters demanding an end to Assad's rule also reject the idea of a new alliance with the American government. Secretary of State Hillary Rodham Clinton and Obama stressed that no one would impose transition in Syria. "We understand the strong desire of the Syrian people that no foreign country should intervene in their struggle, and we respect their wishes," Clinton said at the State Department. "At the same time, we will do our part to support their aspirations for a Syria that is democratic, just and inclusive, and we will stand up for their universal rights and dignity by pressuring the regime and Assad personally." The White House had planned to make the announcement last week but postponed it largely at the request of Syria's neighbor Turkey, which asked for more time to try to persuade Assad, and because Clinton and other officials argued it was important to build a global coalition to demand his departure. U.S. intelligence analysts believe one possible outcome of a post-Assad era is a Lebanese style government in which Syrian political parties form along sectarian lines, with some pro-Iran, some Sunni Muslim, some Christian. One U.S. official said a positive sign is that the protesters across ethnic and religious lines appear to have maintained a cohesive, unified front. That shared experience, coupled with unseating Assad, could forge ties between disparate groups. Another possibility is that Assad gets pushed out by members of the existing government, who use his ouster to win back the people.